The USWNT and Brazil both won in convincing fashion and will face off on Thursday morning (9AM ET) in the gold medal match. Germany and Japan (maybe it’s me … but doesn’t that sound awfully World War Twoish?) will square off in the Bronze medal match-up (6AM ET). Kudos to Japan for making it to this level. They should give Germany an interesting time of it. Brazil was absolutely dazzling in their game, totally dominating the play after Germany went up 1-0 on a Birgit Prinz goal. The Brazilians settled in and proceeded to score textbook goal after textbook goal, finishing up at 4-1. The USWNT’s game unfolded in strangely similar fashion, with Japan going up 1-0, but losing ground steadily as the game progressed. Here’s Beau Dure’s take on the match (from USA Today). Nice to see that the games are drawing big crowds … and interesting that they’d have Nicole Petignat of Switzerland officiating. She, you may remember, was the official who gave Shannon Boxx the red card in the Women’s World Cup. In this game I thought (like Beau Dure) that she made some dubious calls and looked horribly sour and annoyed every time the camera was on her. I hope that seeing her in the semi’s will means that she’ll be far from the pitch in the final! 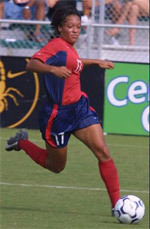 Angela Hucles continued her phenomenal run through the Olympics, with a goal in each half. As a Boston Breakers fan, I’ve always rooted for Angela … and her play under Pia has been just phenomenal. It should help the nay-sayers understand why she has so long been on the USWNT squad … and yet it also makes me wonder what it is about Pia’s coaching that brings out skills and strengths that April and that Ryan guy were apparently able to recognize, but not able to develop and exploit. Anyway – the scoring for the USWNT wasn’t quite as pretty as the show the Brazilians put on – but it was oh-so-nice to see. Hucles started it off, scoring off a lovely cross from the hard-working Heather O! Lori Chalupny followed only a couple of minutes later with a blast that was still rising as it hit the back of the net. The score stood at 2-1 at the half, and Japan looked very much on their heels. The second half started with both teams creating chances … and no one was resting easy in these environs! Heather O relieved the tension significantly with an outside shot/cross that seemed to fool the Japanese keeper … and made the score 3-1. Then Angela Hucles followed with her second goal of the match (and fourth of the tournament) on a nice shot from a very sharp angle (again, one of those shots that looks like a cross … or crosses that could be a shot). Someone will have to interview Hucles and HAO and find out what their intentions actually were! Japan scored in a scrum right at the end of the game. And now it’s time to rest up … and get ready for Thursday. Way to go ladies … one more … then it’s on to the WPS!!! This entry was posted in Soccer, etc. and tagged angela, Angela Hucles, beau dure, birgit prinz, Boston, Boston Breakers, Boxx, Brazil, brazilians, Breakers, Bronze, Germany, goal, gold medal, HAO, Heather, Heather O, Hope, Japan, Lori Chalupny, Nicole Petignat, Oly, Olympic, olympics, Pia, Ryan, Shannon, Shannon Boxx, Switzerland, USA, USWNT, wnt, WPS. Bookmark the permalink.